“Should I consider a prenup?” While this is a question that crosses many people’s minds, relatively few do anything to help themselves find the right answer. If your fiancé(e) has school loans, credit card debt or other debts that he or she will bring into your marriage, signing a prenuptial agreement can provide clarity as to your role (or lack thereof) in helping to pay them off. You can also use a prenup to establish terms for taking on new debt during your marriage, and you can agree in advance as to how debt will be divided in the event of a divorce. Who will be responsible for paying your bills? Will you and your spouse have joint access to all accounts? Do you want to place limits on monthly expenditures for non-necessary items such as entertainment and luxury goods? To avoid conflicts (and expensive surprises), many people find it beneficial to address these types of issues in their prenuptial agreements as well. Tax season can be a stressful time even under the best of circumstances. If you and your spouse disagree about your filing status, i.e. what deductions you want to take, and what steps you want to take in order to reduce your tax liability (such as making charitable donations), this can make filing your taxes even worse. 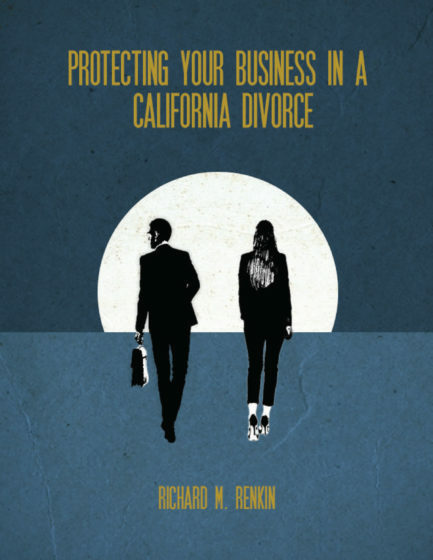 Under California law, if you die while you are married, most of what you own will become your spouse’s property. Your spouse will also acquire the right to make financial management and life-and-death medical decisions if you become incapacitated. While these are issues you can address through your estate plan, in many cases it will be necessary or beneficial to clarify your spouse’s rights (and any limitations on those rights) in a prenuptial agreement as well. If you own a business, you can use a prenuptial agreement to maintain exclusive control of your business during and after your divorce. Even if your fiancé(e) is not interested in taking on a role right now, this could change in the future; and, if you need to reinvest revenue for capital acquisitions, you need to make sure this will not jeopardize your exclusive ownership rights if you eventually get divorced. If you and your fiancé(e) are prone to conflicts, you can also use a prenuptial agreement to specify methods for dispute resolution. These can include working with a therapist or going to mediation, and you can specify when your prenup’s dispute resolution provisions will apply (i.e. only to disputes involving financial matters or other matters of similar importance). Finally, negotiating a prenuptial agreement can also serve as a type of stress test for conflict resolution during your marriage. If you and your fiancé(e) are able to work together to develop an agreement that adequately reflects your shared and respective interests, this can send a far different signal than failing to come to terms. If you live in the North County San Diego area and would like more information about the benefits (and potential drawbacks) of prenuptial agreements, we encourage you to get in touch. To request an appointment with family law attorney Richard M. Renkin, a California Certified Family Law Specialist, please call (888) 837-3564 or inquire online today. DISCLAIMER: All information within this web site is for reference purposes only and is not guaranteed to be correct, complete, or up to date. Further, this information is NOT to be considered legal advice regarding your particular situation,and an Attorney-Client relationship is not created by viewing this information. Changes in the law or the specifics of your case may result in legal interpretations that are different from those presented. You should always seek advice directly from an attorney.